Making a cook happy might benefit you, too. There are folks like me who actually like to get kitchen gadgets as gifts during the holidays. If you have someone like that in your life and they aren’t looking for jewelry, a Porche or an expensive trip somewhere, here are some fun alternatives they might like. Mastrad is a company that offers stylish, functional and innovative culinary accessories and their newest product is the Topchips Chips Maker, which creates light, crispy, fat-free chips in just minutes. Simply slice the vegetable/fruit of choice with the mini mandoline, place the slices on the silicone tray, put the tray in the microwave for 3 minutes. You can actually see the slices cook and become crispy chips right in front of your eyes. This is the perfect snack during the Fall season for the kids when they go to school because it is not only simple to make, but it’s delicious too. The Chips Maker has a retail price of $19.99 and is available online at www.shopmastrad.com. The Mastrad Macaron Gift Set is ideal for making perfect macarons, just like a professional pastry chef! This gift set comes complete with four components: the indispensable tool, the pastry bag, to easily shape your macarons; the essential accessory, the macaron pastry sheet, to make equally sized macarons; the key to success, The Macarons Cook Book from Mastrad’s Essentials Collection with over 35 recipes; and the storage, the pastry bag stand, so as to always have it handy. All together, this gift set is the perfect package for making both sweet and savory macarons. The Mastrad Macaron Gift Set has a retail price of $39.99 and is available online at www.shopmastrad.com. This beechwood rolling pin comes with 3 adjustable rolling depths so you can dial the thickness of any dough that you are preparing. It's great for pizza, pie dough, pastries, cookies, and fresh pasta! The 13" long rolling pin also Includes both metric and imperial length and height measurements along the length of the pin. The suggested retail priece is $19.99 and it's available online at www.thinkgeek.com. The At Home Mushroom Growing Kit is the perfect gift for the foodie who has everthing. This kit will produce up to 1.5 lbs of pearl oyster mushrooms. And, it's so simple even a toddler can do it. The kit can be a fun family project as well and it'll produce the perfect fresh ingredients for your recipes when it's time to harvest. Yonanas is a terrific appliance that turns frozen bananas and other frozen fruit into a tasty treat that looks and tastes like soft serve ice cream. The Yonanas is incredibly simple to use: peel over-ripe bananas and freeze them for 24 hours; insert them into the yonanans feed tube and repeat with other forzoen fruits, nuts or chocolate. The result is a soft frozen tasty dessert! As you look for ways to boost your intake of minerals and vitamins, improve your athletic performance or shed those unwanted pounds, you might not have to look much further than a simple banana. Available year round in its own environmentally-friendly packaging, the banana is a healthy choice for the young and the old. And, with the Yonanas maker, you can now easily enjoy them as a creamy and healthy dessert. The Yonanas Maker has a suggested retail price of $59.99 and it's available in a number of stores and online at www.yonanas.com. For those of us who aspire to unclutter our lives and our homes ... or who at least want to see our kitchen counters again, Ninja® introduces the Kitchen System Pulse™. The Ninja® Pulse™ is a new kitchen tool that will tackle almost any challenge in the kitchen without taking up lots of space. It delivers powerful versatility – providing blending, chopping, juicing, and mixing muscle, all in one svelte package. And if that’s not enough, the Pulse also offers Ninja-powered single serve technology for those who want the option to easily create individual portions. Despite its slim profile and light weight, the Ninja Pulse is a multi-tasking heavyweight when it comes to performance. Its unique design – a combination of 700 watts of power and Ninja’s blade system – makes the Pulse a product that can truly do it all. Blend delicious frozen drinks, chop fruits and vegetables evenly, crush ice – turning it into fluffy snow, puree fresh baby food, whip up creamy frozen ice cream … the options are almost endless. The suggested retail is only $99.99 for the Pulse. The motor base comes with a 40 ounce bowl and the lid with locking handle, storage lid, blade assembly, dough hook, and cookie dough paddle to go with it, as well as three single serve drink cups, the single serve blade assembly and three To-Go single serve cup lids. More information is available at www.ninjapulse.com. Spring into action and bake your favorite treats more often with the Just Enough Springform Pan from Zenker. This springform pan, which is one fourth of a regular ten-inch pan, is just the right size for cakes or cheesecakes, making baking an everyday affair. It's perfectly sized for singles, couples and small families who don't want leftovers. It's also ideal for making homemade gifts for teachers, friends and co--workers. The durable nonstick coating ensures easy clean up and prevents the cake from sticking to the pan. Manufactured by Zender, one of the oldest bakeware manufactures in the world, it has a suggested retail price of $9.99 and is available at www.frieling.com. 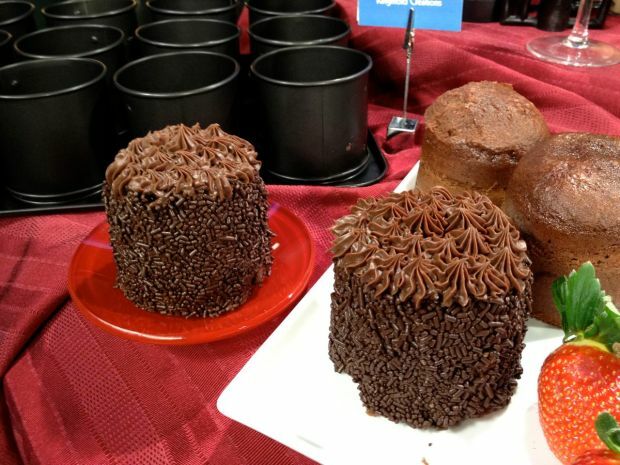 Create eye-catchign desserts, savory appetizers and mini gourmet side dishes with the new Ring Mold Creations from Zenker. Fun and easy to use, these multifunctional ring molds can be used for baking, chilling or freezing individual servings of food in perfectly uniform round shapes. Ring Mold Creations comes with 12 single serving molds and a base; the ring molds snap onto the base for convenience and best culinary results. You can use them to individualize breakfast quiches for the family,make rice dishes or build a tower of salad for lunch, or to top off the day with tangy fruit tarts, individual cakes or refreshing molded ice cream sensations. Made with a nonstick coating for easy release and cleanup, Ring Mold Creations sell for a suggested retail price of $48 and is available at www.frieling.com. Flour and eggs go in your cupcakes, not in your tablet. A modern chef can cook without a recipe, having an intimate knowledge of ingredients, flavors, and their relationships to each other. For the rest of us, we need cookbooks. But, rather than formal books, more and more folks are searching for and keeping recipes on tablet computers. The drawback to this approach is one of mess. Tablets aren't cheap, and they're easy to break with all the goop that tends to fling, fly, splat, spill and spread during the cooking process. Finely ground flour can easily find its way into any seam, liquids can ooze their way behinds screens, and can short out the sensitive electronics inside. Basically, cooking and tablets don't mix. Until now. A simple application of a special sealable plastic bag keeps the capacitive property of touchscreens working, while completely protecting your tablet from all the mess and potential catastrophic damage. The Chef Sleeve fits any iPad, iPad 2, or other similarly sized tablet. A pack of 25 sleeves retail for $19.95 and is available at www.thinkgeek.com. The SNAPI is a simple device that allows you to grab a full serving in one bite, using a single hand. The Snapi has a built in lock for storage and is perfect for buffets, salad bars, pasta bars, caterers and in the home. It's dishwasher safe with a bonded rubber grip surface. The SNAPI sells for only $6.95 and it's available online at www.kitchenhappy.com. If you have trouble keeping up with your kitchen towel, here's an incredibly simple solution. The LeTowele is a Retractable Microfiber Towel. Connected to your belt or a simple velcro wraparound, it's always by your side when you need it! The retractable mechanism can also be used with your own kitchen towels as well. The LeTowele sells for $9.95 and it's available at www.argeecorp.com.